Up and comer DJ YRS Jerzy has been making his rounds all around the internet and the streets. Jerzy has been working for a long time to get to where he is going now. 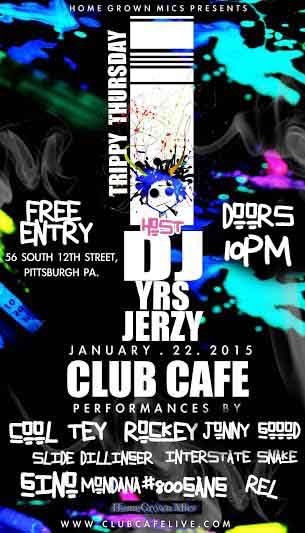 As he continues to make more and more happen as the days go by he was chosen to host a great event out in Pittsburgh titled #TrippyThursday Presented by Home Grown Mics. The event name is self explanatory bringing artists from all around the US to showcase their talents. The line up includes artists on the come up in each area they are located. Some artists featured on the show are Slide Dillinger who released a track with Cam’Ron a couple of months back, Gino Mondana who is an affiliate of the GS9 camp out in Brooklyn NY. Rel who is based out in Pittsburgh and works with a couple majors out in the area, Rockey, Jonny Goood, Cool Tey & Interstate Snake who has tracks out featuring artists such as Tone Trump, Troy Ave and more. It will be a great show if you need any more details all the info is on the flyer it is a free event and officially starts at 10:30 Pm. If you are in the area you will not want to muss out on this show. There might even be a major special guest that will appear. Stay tuned on social media and use the hash tag #TrippyThursday when talking about the event.